This post shown how JAXB2 Schema validation can be used in your project, validating the generated XML against specific XML Schema Definition [XSD]. An XML Schema Definition describes the structure of an XML document and governs the rules and constraints being applied on XML content. JAXB2 provides API to validate the generated XML against an XSD in order to verify the correctness of generated XML. Below is the XSD file [“edu.xsd”] used to validate the XML generated via Student & University mapping example. Please note that Section element in below XSD contains a minLength constraint(4 chars). We will verify the validation against this constraint. 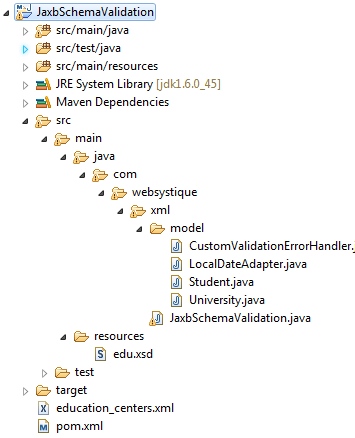 Create Marshaller to Generate XML from mapped and populated Java objects using JAXBContext created above. Set the Marshaller schema to the one created above. Use Javax.xml.validation.Validator class to validate. Provide an ErrorHandler implementation required by Validator. That’s it. In case the generated XML does not comply with specified schema , Marshaller/Validator will throw error and eventually fail. Caused by: org.xml.sax.SAXParseException: cvc-minLength-valid: Value 'Com' with length = '3' is not facet-valid with respect to minLength '4' for type '#AnonType_sectionStudent'. That’s all with validations. Below is the complete example for this post. @XmlRootElement can be used to map a java class to the root of XML document produced by that class. Once applied on a class, all properties of that class maps to XML elements. You can however , use @XmlElement on individual property to override default behavior( for example specify an Element with different name in XML than in java, specify required/optional/nillable attributes).For example Student.dob will be mapped to birthDate in XML. Create a Custom error handler to be used by Validator during schema validation. That’s it. In the next post , we will discuss about the code generation using XSD.